Company name: The Guardian Academy Pte. Ltd.
Re: The Guardian Academy Pte. Ltd. This is a follow-up article based on The Guardian Academy’s closure back in late February. Click here to read the original article that was written after the closure. Earlier this month, Jessiy, a parent affected by the closure of The Guardian Academy two months ago wrote in to several ministers and even Prime Minister Mr. Lee Hsien Loong in desperate attempt to find a solution to their problem. She also directly contacted the Police to seek help. It was the end of February when the sports academy suddenly came to a close – affecting over 200 parents who signed their children up for the school’s membership. The parents were required to pay a membership fee of S$3000 to S$4200 which entitled them to the academy’s membership till their children turned 18. According to Consumers Association of Singapore (CASE), the highest amount paid by one of the parent totalled up to almost S$12000 for four children. The parents were unable to stop the GIRO payment because many signed a contract with the bank to pay by installment. CASE stated that little could be done because of the small amount involved in the situation. As according to the NGO, the amount of money involved was too “little” in this incident. Small claims will not be able to help them too because the company is still “registered”. The academy was established in 2012 and aimed to identify the type of sports children were naturally good in. One of the academy’s directors is former national football player Mr. R Sasikumar. In her letter to the Ministers and the Police, she outlined the whole problem the parents were facing with the sudden closure. This included the brief summary of the different meetings they had with Mr. Sasikumar and his lawyer. She also pointed out that 2 out of the 3 bosses of the company are “totally missing in action”. Jessiy also emphasised her disappointment in the lack of protection of consumers in Singapore. In reply to her email, Mr. Wee Chai Meng of the Singapore Police Force said that he “felt sorry for the experience that (she) and the other parents have encountered with The Guardian Academy”. However, he mentioned that after “carefully reviewing the facts”, they found the case to be “civil in nature”. The Police then clearly stated that they “will not be taking any action”. The reply added that even if the Police does not take action, it “does not negate (her) right to seek civil recourse to recover your loss”. This is despite the fact that in the email Jessiy already clearly stated that the parents involved are “merely middle class citizens who are not able to take a lawyer and fight this case as more money will be spent”. Upon receiving the Police’s reply, Jessiy immediately forwarded it to Mr. Lee Hsien Loong and questioned the effectiveness of the Police Force. As of 17 April, no reply has been received by the Prime Minister’s office nor any of the ministers. More than 200 parents lost significant amount of money with the sudden closure of The Guardian Academy last month. The children’s sports talent academy apparently closed down due to an accumulation of excessive debt and inability to cope with the payment for their rental and coaches. The parents were required to pay a membership fee of S$3000 to S$4200 which entitled them to the academy’s membership till their children turned 18. According to Consumers Association of Singapore (CASE), the highest amount paid by one of the parent totalled up to almost S$12000 for four children. Mr. Sasikumar talked about the possibility of a liquidation of the company to help alleviate severity of the situation. Jessiy mentioned that there might be “nothing left for them” in the end with all the money potentially used to pay for debt and other costs (rent, labour etc.). Unfortunately, many parents also signed a contract with a bank to pay by installment, and are not able to stop the GIRO payment that is still currently in operation. When the issue was brought up to Consumers Association of Singapore (CASE), nothing much was being done. As according to the NGO, the amount of money involved was too “little” in this incident. Small claims will not be able to help them too because the company is still “registered”. Many parents also lodged a police report regarding this issue but nothing much was done either, as the cases were “for filing purposes only” by the police. The Commercial Affairs Department (CAD) also informed them that they were not notified of the case. Jessiy expressed her frustration that there are “hardly any rights to protect the consumers” and they seem to have no one nor organisation to turn to for help. Eventually the “parents have to suffer” for this incident even if they were not the ones responsible for it. 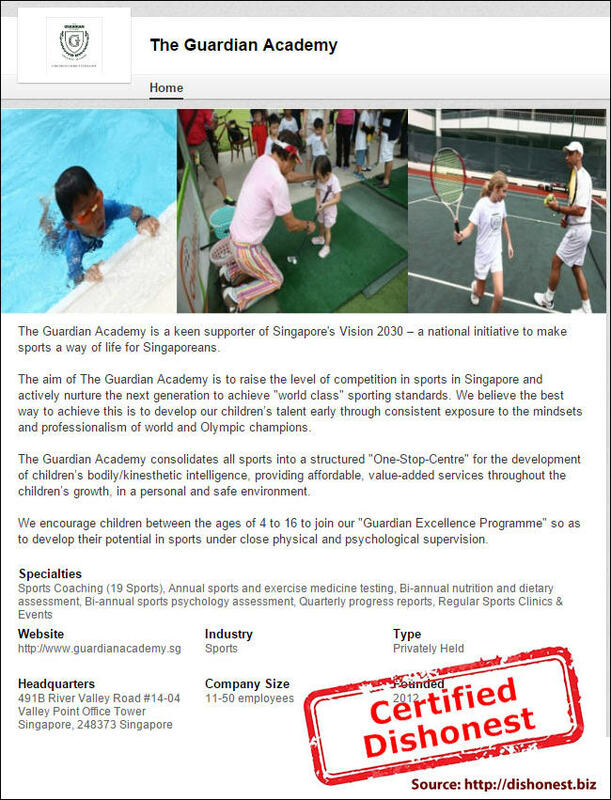 SINGAPORE — The abrupt wind-up of sports coaching centre The Guardian Academy, announced in an email to parents on Monday, has left a trail of creditors and irate parents demanding fee refunds. At least six firms working with the academy — which mentors children and youth from four to 18 years old — to provide various sporting activities, such as golf, wushu and badminton, told TODAY they are owed between S$200 and more than S$2,000. Parents typically paid the academy, which was co-founded by former national football player R Sasikumar, a subscription fee of S$4,200. Upon enrolment, a child attended trial sessions for up to five different sports before he or she decided on a particular sport to pursue. On top of the subscription fee, parents paid the academy lesson fees, at a discounted rate. The academy would in turn pay the sports firms for providing the lessons. Former national shuttler Ronald Susilo, who runs his own badminton academy, said he is owed some S$2,000 for fees incurred between September and December last year for six students referred from the academy. “The amount is not big but what I felt was disappointing was that they promised me they would settle payments in two sessions, and to give them more time. They said they were restructuring the organisation, and now suddenly this happened,” he said. Mr Susilo, who has reported the matter to the Consumers Association of Singapore (CASE), hopes he can have his money back or at least get an explanation. “They can’t just suddenly close down this way; it isn’t right,” he said. Another firm left in the lurch is softball academy Momentum Sports. Its founder Suzanne Tan said the firm has been owed S$1,340 since June last year. Ms Tan said she has been chasing the academy for payments but to no avail. In response to TODAY’s queries, a reply signed off by “The Management” explained that they had closed the academy — which opened in May 2012 and had 173 members — because it “couldn’t manage its cash flow due to the overwhelming request for refunds by members”. It acknowledged that it could have managed the communication process with parents better. “We apologise for the manner (in which we communicated) which might (have) caused the parents to react the way they did,” it said. TODAY understands the academy’s partners began seeking payments directly from parents since late last year, after it failed to pay them on time. This prompted some parents to withdraw their children from the academy and to request refunds. Meanwhile, more parents have come forward, with CASE saying there were at least 40 complaints filed with them as of 2pm yesterday. Five parents who spoke to TODAY said they have made police reports. One of them, homemaker Monica Lau, 44, said she had paid the subscription fee via a 36-month instalment plan to enrol her nine-year-old son Manuel in the academy. “Frankly, even if I don’t get my money back, they should not get away with this,” she said. The police confirmed that reports had been lodged. “The complainants have been advised to seek their own civil recourse,” a spokesperson said. CASE said consumers can file their complaints with the Small Claims Tribunals and that it will render assistance to help consumers submit their claims to the official receiver or liquidator. A search on the Accounting and Corporate Regulatory Authority website’s showed that the academy has not been deregistered. It has three directors and has a paid-up capital of S$100,000. SINGAPORE - At least 34 parents have lodged complaints against a children's sports talent academy after it shut its doors suddenly on Monday. One parent has even gone to the police. Most had paid The Guardian Academy a membership fee of around $2,800 to $4,000, which was supposed to cover their children from the time they joined until they turned 18. The highest amount involved was $11,500 for four children, said the Consumers Association of Singapore (Case), which confirmed on Tuesday that it had received 34 complaints from parents, most of whom were asking for a refund. One of the academy's directors, Mr R. Sasikumar, meanwhile asked parents to be patient. "As soon as we find a solution that will be of some use, we will announce (it) to the parents," he said. The former national footballer added that he was "sparing no efforts to get to the bottom of things", referring to the company's cashflow issues. When it opened to much fanfare in May 2012, The Guardian Academy, run out of an office in River Valley, said it could help identify which sports children are naturally talented in. It also claimed it would provide medical check-ups and bi-annual sports psychology assessments. On Monday, it sent out an e-mail to around 200 parents saying it was ceasing operations, and that it had sacked its vice-president of sales, Mr Hari Letcheman. Several parents have since revealed that their children had taken part in just one or two activities over the past year. Said self-employed Francis Tay, who signed up his six-year-old daughter in March last year: "The activities were not as regular as we thought they would be." The 43-year-old added that he has paid close to half of a $4,000 instalment plan provided by a bank in a tie-up with the academy. He also said he has been trying to cancel the instalment plan, and that he has lodged a report with the police and Case. "It seems like there was some tension between the owners and the management. Unfortunately, the customers became the victims," he said. Case executive director Seah Seng Choon said the watchdog will see how it can help the parents. He added that since the company is still listed as live with the Accounting and Corporate Regulatory Authority, parents can go to the Small Claims Tribunal.